In the vineyard we work in a traditional way. We concentrate more on trying to grow a healthy vine, able to withstand pests and feed itself naturally, than on chemically sheltering the vine from external hazards. This means developing a healthy soil and a balanced ecosystem within the vineyard. A natural soil is a living thing that we try to preserve in good balance by regular ploughing and by allowing some degree of biodiversity in the vineyard. The vines live alongside with natural grass, as well as insects, birds, and other small animals. We never used industrial fertilizers nor chemical herbicides since the very first vineyard we planted, back in 1997. The only exception is a moderate use of dusting sulfur and copper. By the end of July, we may practice “green harvesting” to remove immature grapes and achieve the desired yield and quality. In fact, selectively removing part of immature grapes while they are still green induces the vine to concentrate on the remaining grapes, thus resulting in better ripening and more numerous and mature flavour compounds. Choosing the right moment to harvest is always important, but for us is essential, because we do not have the option of chemically or physically correcting for wrong timing, as conventional winemakers are used to do later on in the winery. It’s a question of instinct, if you want, guided by years of experience and communion with the surrounding natural environment. 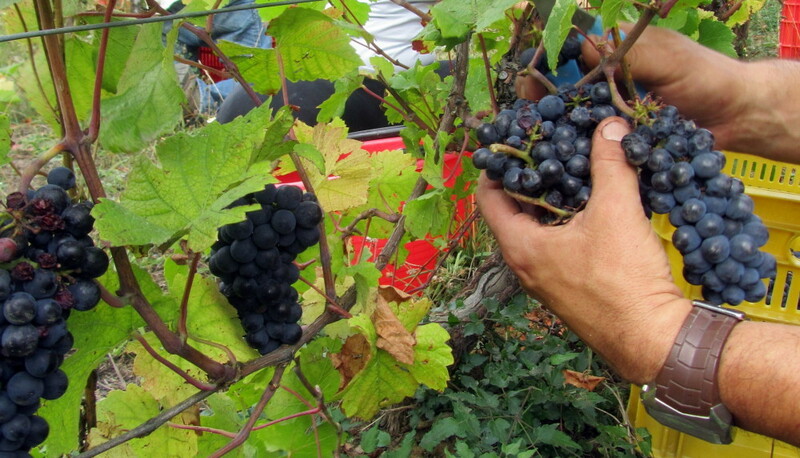 At harvesting time, the grapes are hand-picked and the best grapes are selected directly on the vine. Unripe or damaged grapes are rejected. The grapes are then collected into small containers, to avoid being crushed under their own weight. We do not use industrial yeasts to ferment our wine, only the wild yeasts native to our land. This gives to our wine its distinctive personality. Furthermore, our wine is fermented only with its own sugars. During the entire process of vinification, we do not use any chemicals to correct for wine imperfections. We do not normally add sulphites (SO2). Sulphites occur naturally in all living things and are present in small quantities even in unsulphured wines. The level of sulphites in our wine is among the lowest in the market, the maximum level being about 20 mg/lt (total SO2) for some labels. However, the majority of our wines have no added SO2, and in this case the concentration of SO2 is even lower, sometimes lower than the detection threshold of the analysis tools. Finally, we do not fine nor filter our wines. The alcoholic fermentation is completed with maceration on the grape skins. This phase can last from 40 days for the pinot noir down to 8-10 days for the white wines. We perform maceration on the skins also for white wines, because this technique was traditionally adopted in the past by local wine makers, and because we believe it improves the flavours and enhances the character of the wine. The pinot noir is then aged in wooden barrels (500-liter tonneax and 228-liter barriques) usually for 12 months, and up to 18 months in some cases.